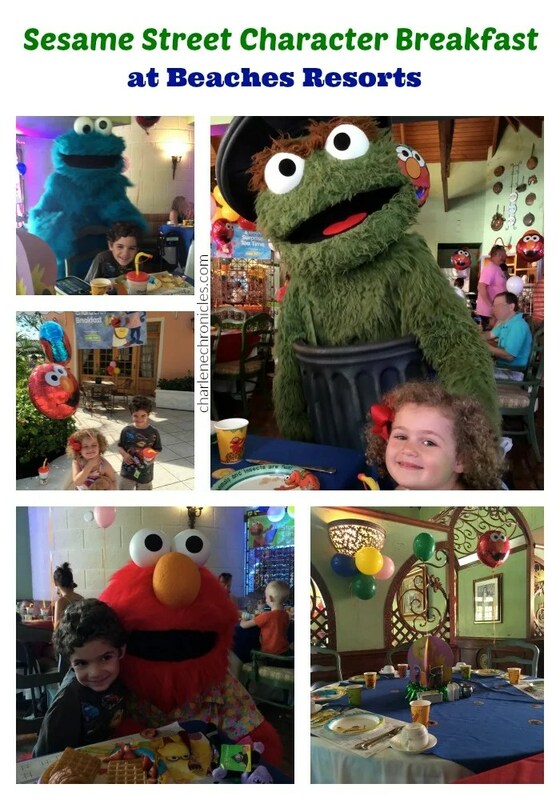 We got to experience the Sesame Street Character Breakfast at the Beaches Resort on Turks and Caicos on our trip recently. We were hosted as part of the Social Media on the Sand conference and it was a great experience. The Sesame Street Character Breakfast is an addition cost in the all-inclusive vacation at Beaches Resorts and costs about $25 per person. However, the cost gets the kids an up and close experience with all the popular Sesame Street characters: Grover, Cookie Monster, Ernie and Bert, Oscar, Big Bird, the Count, Elmo, Abby Cadabby and Zoe. Parents are encouraged to take their own pictures, but the onsite ‘SnapShots’ team – a group of professional photographers – take pictures that you can purchase before leaving the resort. As part of the price, you get a full buffet breakfast and the characters come to each table. Kids get a special sippy cup (value $5) with a small Sesame Street character doll tucked inside (value $14). Kids are also able to take a balloon with them when they leave! Between these extras, the cost ends up being a wash for the kids, so the monetary outlay is really just for the parents if you would have purchased those items in the gift shop. In addition to the meet and greets, at the end of the breakfast, there was a dance party with the characters, which was fun for the kids. However, if you are unable to participate in the Sesame Street Character Breakfast experience, don’t despair. There are lots of character experiences included in your Beaches vacation – like a Sesame Street Character Birthday Party, baking cookies with Cookie Monster and more. It just means you have to set aside the time to attend a variety of events to see the characters, but it is doable to have those up close encounters during your stay. It is much easier to interact with the characters compared to the ones on your Disney vacation. My kids loved how much they got to see, hug and high five them all. You can stop by the Sesame Street Kids Camp location and pick up a brochure that lists all of the character opportunities for the week. Your kids do not have to be enrolled in kids camp to participate in those activities – although at times, the kids at the camps get more opportunities to interact and participate in additional character opportunities, at different times, or in smaller groups. I should also mention some other Sesame Street related extras that you can arrange during your trip if you have little Sesame Street fans. Like a birthday party for your child or bed time tuck in service. You can see all the opportunities here. All in all, who doesn’t love a tropical resort with white sandy beaches, but with the extra element of the special Sesame Street characters, it really makes a Beaches Vacation extra special and extra fun for the entire family.